"In and around Tenganan On the east coast of Bali, surrounded by high mountains, lies an ancient fortress village called Tenganan. 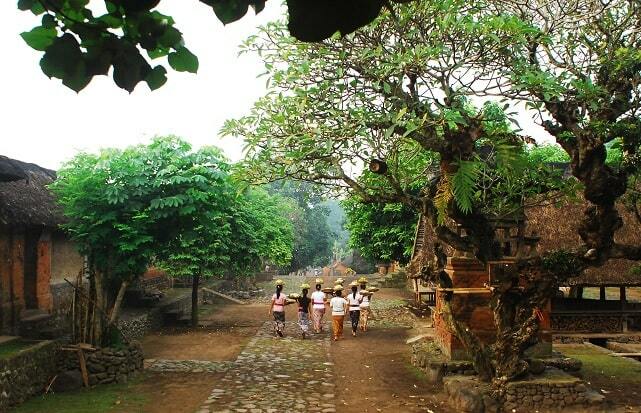 Dating back to at least the 11th century, Tenganan preserves certain ways life lost to the rest of Bali. 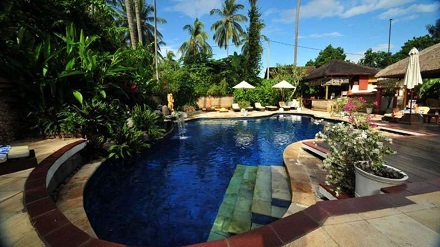 It is regarded by the Balinese as a ‘senior’ village." The descendants of these people call themselves Bali Aga, meaning original Balinese. They lived isolated and independent in the mountains where they found refuge from imperialistic invaders. Hidden in the hills of East Bali lies the village of Tenganan, where the most conservative of the Bali Aga preserve the old traditions with the greatest zeal. 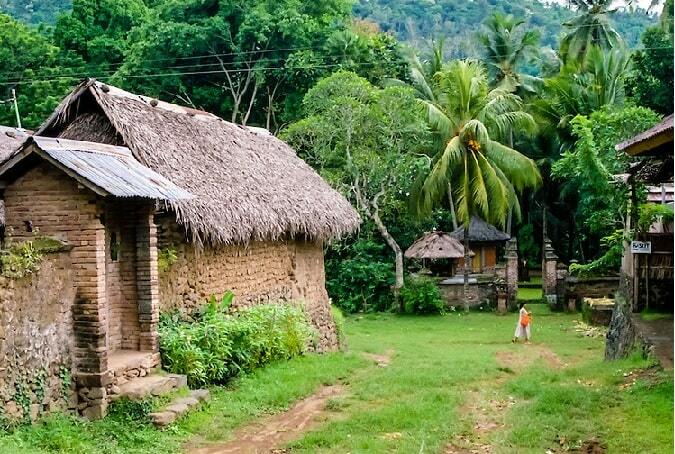 Tenganan is still an isolated community, socially and economically separated from the rest of Bali. It is shut off from the world by a solid wall that surrounds the entire village. The wall is meant to keep outsiders away, and it is broken by means of four gates, facing north, south, east and west respectively. Within these walls lies a banyan tree surrounded by a low wall of uncut stones, providing the small enclosure for a very sacred temple. Unlike the rest of the villages in Bali, there is hardly any vegetation around the houses of Tenganan, which are all exactly alike. They are arranged in rows on each side of stone - paved avenues. In the central place is the council house where the elders meet. This council house is some seventy feet long, strongly built and apparently very old. Farther along are other buildings for public use. The dwellings in Tenganan are all exactly the same. A flight of steps leads to a small gate which opens into a court where the sleeping - quarters the kitchen, and a long house for storage are all located. There is also a small empty shrine where the spirits may rest when they visit their descendants. The people of Tenganan are tall and slender in a rather ghostly way with white skins and refined manners. The majority of the men still wear their hair long. They live in a communistic system in which individual ownership of property is not recognized. The village of Tenganan owns enormous tracts of fertile and well - cultivated lands that fill every need of the village and make it one of the richest in the island of Bali. Houses in Tenganan Pegringsingan village are built on either side of the north to the south concourse with their doors opening on to it. The entrances of the houses are narrow, only allowing one person to enter or leave at any one time. One enters the village through the gate on the southern end. On either side of the entrance are two small temples. This secluded resort is nestled amongst acres of lush tropical greenery, waterfalls, and lily ponds, complemented by charming thatched roofed cottages. Proudly boasting the title of one of Bali’s most romantic resorts, The Water Garden Hotel Bali is the perfect retreat for both honeymooners and families alike. The serenity of the resort is enhanced by the sound of free flowing water and tranquil rice paddies, making guests feel as if they are a million miles away from the hustle and bustle of the city. There is an array of activities to occupy their time including scuba diving and trekking. The Water Garden Hotel Bali offers unique vacation prospects, whether it’s a trip to the nearby village of Tenganan where ancient weaving traditions can be observed or trekking up the ancient mountain of Agung, your stay will most certainly be a memorable one. 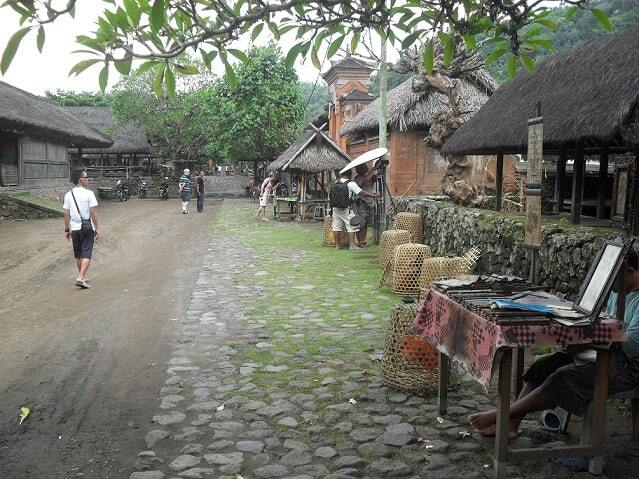 "Visiting this village was one of the highlights of our holiday in Bali. It was such a relief to escape from the usual hustle and bustle and take our time wandering around this traditional village watching the villagers quietly working on their weaving, basket making etc, We happily purchased quite a few treasures from this village knowing that the money was going directly to the people who had made the goods. Our driver had never been and was also very impressed and said he would definitely take people there in the future. Candidasia is also worth a visit so ensure that you make this a must do when in Bali."